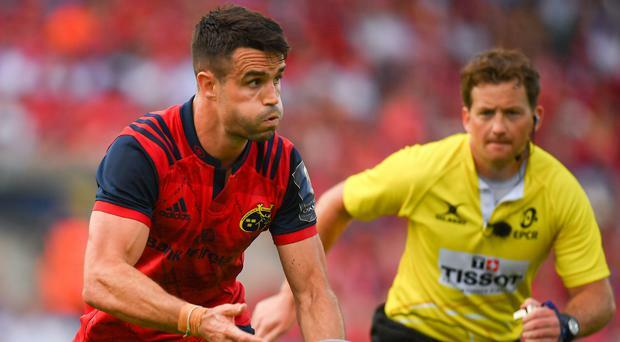 Discovering your optimum performance weight is something every player has to go through, according to Munster and Ireland star Conor Murray. Murray's team mate Keith Earls has spoken this year about how he struggled to find his best weight and struggled to get to 95kg but eventually discovered being around 86kg got the best out of him. Earls' gym sessions last 150pc longer than his younger team mates and involve fewer weights and he does his own bespoke warm-up. While Murray has not gone on the same kind of journey, he told The Left Wing, Independent.ie's rugby podcast in association with Laya Healthcare, that he struggled when he put on too much bulk and has now found a routine he is comfortable with. "I listened to Earlsy on your show a couple of weeks ago and I'm obviously close friends with him. I learned a lot from him," he said. "He spent a lot of time trying to be heavy and fast, trying to be lighter and a little bit quicker and he eventually found his weight. This year in particular, he's had the season of his life and that's worked for him. "On a smaller scale I've always struggled to put on weight but I got to a weight and felt comfortable at it, fit and as strong as I could be at that weight. "For a couple of years I always tried to really push myself in pre-season to try and put on two or three kilos and I managed to do that for a couple of years and I just didn't feel right. It didn't sit well with me, felt kind sluggish, felt unnatural for my body. I suppose every player has to go through that. "When you start off you're told to be as heavy as you possibly can and as fit as you possibly can and that probably puts a lot of pressure on young players. "If the game develops a little bit more, when players come into academies and come out of school, there is a bit more going into their backgrond check and their optimum weight and I'm sure it has. It's not for me to talk about strength and conditioning programmes but I'm sure it has evolved since then. "I think I've found my weight and what works for me. Do I need to do weights on the Thursday or Friday before a game? For me, I like to do that on my own a little. You find little things that work for you and eventually find your system or your routine that puts you in the freshest state before a game. "A lot of lads are so professional and do everything to a tee and they seem to have an injury record or history. I think your body make-up helps you that way."